Waseda University Graduate School of Information, Production and Systems (IPS) is a graduate school that has no corresponding undergraduate department established within the Kitakyushu Science and Research Park area in 2003 as the base for Waseda University to expand its presence in Asia. With three fields of study, including Information Architecture, Production System, and Integrated Systems, IPS undertakes academic research in the technological fields that society currently requires, and strives to attain a sustainable society through the use of technology. Having immediately implemented lectures both in Japanese and English for all courses at the time of its establishment, IPS has been creating an environment where international students par excellence can also study along with Japanese students. IPS actively conducts numerous joint research projects with various domestic and international organizations, such as corporations and universities, and participates in many public projects. The city of Kitakyushu, where IPS is located, has long been thriving as an exchange hub in Asia due to its ideal location. While it is a globally and technologically oriented city, it offers an environment in which residents can fully enjoy rich nature. Living expense is not as high as in the Tokyo metropolitan area, allowing residents to live a comfortable life. In addition, IPS offers various types of well-developed scholarship programs, supporting about 70% of the students. There is a broad array of employers, both domestic and international, in areas such as electric, semiconductor and automobile manufacturing, and information-telecommunication services. Some students launch their own business based on the technology that they learned at IPS. The number of students who return to their home country to become a university faculty member after obtaining their doctoral degree is also increasing. In this border less environment where students come together from various countries, age groups, and backgrounds, those who are motivated enough will find opportunities to obtain engineering knowledge and a global perspective required by the society. The world’s top-level engineering pacesetters gather here for stimulating interaction in an international research environment. IPS brings together students with different cultures, languages, and social backgrounds from various parts of Asia and the world. You can gain the ability to communicate as a citizen of the world in this multilingual, cross-cultural environment. IPS offers subjects available in Japanese and English. In seminars, etc. in laboratories with a large number of international students there are reading circles in which the students take turns reading English academic literature and lively debates are held in English. Furthermore, we are aiming to train researchers and engineers who will be able to function on the world stage. Therefore, we a strongly recommending our students to participate in international conferences so that a large number of our students will have opportunities to give presentations in English at such conferences. From its first year, IPS has been offering lectures in both Japanese and English and students who do not have Japanese language skills can obtain a degree only with English. There are ample opportunities to communicate with students speaking different languages, which helps in mastering practical language skills. Those students who want to learn Japanese and Japanese students who want to learn English can take affordable lessons at the Language Learning Center in Kitakyushu Science and Research Park. IPS aims to create knowledge in the Asia-Pacific at a global level and is actively trying to collaborate with universities abroad. For the purpose of collaborative research, IPS is engaged in partnerships and interchange with many leading overseas universities, especially in Asian countries such as China, Taiwan, South Korea, Thailand, and Malaysia. International collaboration Symposium on IPS, where more than 100 researchers, teachers and students in total come around from everywhere in Japan and abroad, is still growing annually. The huge event provide the opportunity when they present their leading edge research outputs, outcome of collaborated research project, and exchange hot discussion among participants. IPS conducts many joint projects along various lines of cooperation : national, regional, enterprise and institutional. The automobile industry, integral to the industrial base of northern Kyushu. IPS supports its development by working energetically with other universities, research labs, and companies in the region on the R&D of systems applicable to automotive electronics. 3 universities in Kitakyushu Science and Research Park (Waseda University, University of Kitakyushu, Kyushu Institute of Technology) have combined their respective strengths to offer to 2 joint graduate school courses. 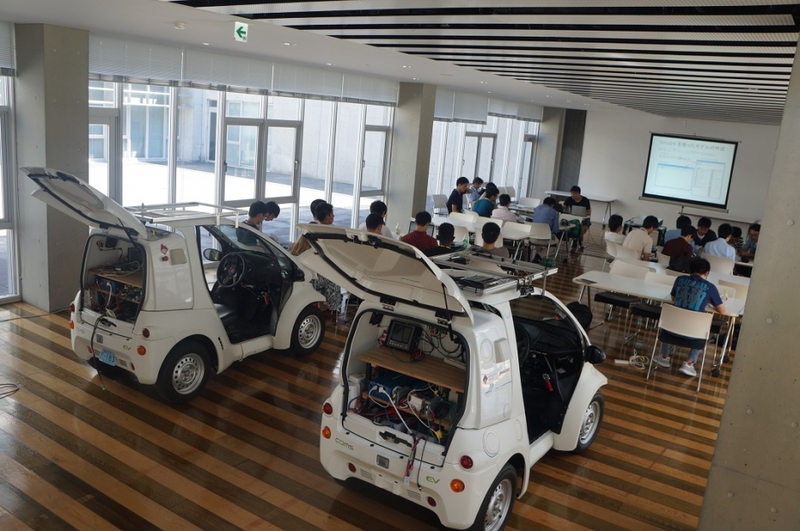 In addition to Car Electronics, and interdisciplinary course covering a wide breadth of learning encompassing not only electronics, but machine engineering, Intelligent Car Robotics is offered in 2013 to study the increasingly advanced and intelligent field of automobile robotics. Both courses are designed to train highly skilled specialists possessing the applied skills needed to become leaders in the next-generation, and graduates from these courses are expected to take on active roles in industry. Most of the teaching faculty at IPS is from industries, which promotes collaborative and commissioned research with firms and overseas universities. Recognition of these achievements has led to a number of publicly funded research projects. Both teaching staff and students are deeply engaged with research in order to realize a sustainable society. IPS has participated in various research projects at a national level as an educational and research institution which supports the development of science and technology. Besides, IPS cooperates with overseas universities and companies and advances many collaborative researches every year for development cutting-edge of technology. Proven job-placement results set Waseda apart. Graduates are making their mark in a host of leading enterprises. The demand for globalization and informanization in all areas of business today means that an ever-expanding field of opportunity awaits IPS graduates, with their combination of wide-ranging specialized knowledge, creativity, and solid practical and communicative skills. You can strengthen your placement prospects still further at IPS through involvement in enterprise-funded research or collaborative projects. An environment opens to varied learning opportunities, where you can prepare for an Excellent Career in a borderless age. The scholarship is awarded annually to students from China studying aboard who are recognized as excellent. In 2010, out of a world total of 504, 39 students were studying in Japanese universities including 6 at Waseda University (the highest number in Japan), of which 4 were in IPS. In 2009, out of a world total of 497, 49 students were studying in Japanese Universitites including 4 at Waseda (the 3rd highest number in Japan), all of them in IPS. Japan Society for the Promotion of Science has “Research Fellowships for Young Scientists” which provides financial assistance for research activities so that promising young researchers can concentrate on research. With the success rate of about 30%, the Fellowship is highly competitive, but a number of IPS’s doctoral students are awarded every year. IPS offers an original “collaborative learning” educational environment that includes various projects such as cooperation with overseas universities and research laboratories, as well as joint research and regional service activities with companies. This practical approach to education with emphasis on collaborative projects lets you prepare for an Excellent Career in which you can play an active role on the global stage.